The automotive industry is currently in the midst of great strides in innovation and development in the fields of electric vehicles, connected cars and autonomous driving. It is not surprising that technological advancements in the fields of battery technology and computer systems have paved the way for ascension of the electric car. Many manufacturers are betting vast sums of money that these cars are the future. To put matters into perspective, Tesla’s estimated R&D expenditure for the past decade exceeds $1 billion. In view of the media frenzy surrounding electric vehicles as a modern revolution in transport, I could be forgiven for my assumption that electric vehicles are a relatively recent technological phenomenon. Imagine then, my surprise to encounter a United States patent titled “Electric car” published in 1885 and attributed to the inventor “Anthony Reckenzaun of England”. The patent in question relates to braking mechanisms for electric cars and the recovery of energy during braking for use elsewhere in the vehicle. This discovery made me wonder about the earliest history of the electric car. It is easy to assume that electric vehicles are a modern day innovation. After all, since the dawn of the commercial era of the combustion engine in the 1920s, cars propelled by oil and gas derived hydrocarbon fuel have had a near monopoly over the personal automotive market. An internal combustion engine is the only means of propulsion that the considerable majority of car owners who are alive today will have ever known. However, electrics cars as we know them today can trace their history back to the innovators of the late 1800s. While an early patent alone is no guarantee that Mr Reckenzaun’s invention was ever used in a commercially available vehicle, The Electric Car Company of America applied for a number of patents for electric vehicles, or their components in 1888, including United States patent US400830. Indeed, in the late 1800s and early 1900s, ownership of an electric car for personal use was relatively common, particularly in Europe. Many technological developments that seem like relatively modern vehicular phenomena can find their roots in this early golden age of electric car innovation. For example, both Mr Reckenzaun’s invention and an invention by Victor Turner and Harold Thomas from 1916 shows considerable conceptual similarities with the Kinetic Energy Recovery Systems (KERS) made popular by its use in modern day Formula 1. Unfortunately, early patents fail to provide a fully detailed technical history of the first electric cars and information is scarce. Many companies either didn’t protect their technology via patents, or instead chose to protect the corresponding technologies in the established railways market (such as the Electric Car Company of America’s US431720) as opposed to the small and emerging market of automobiles. The range limitations of historical battery technology in combination with the gradual reduction in cost of hydrocarbon fuel and the internal combustion engine saw early electric vehicles no longer meeting the demands of the discerning public. Widespread use of electric vehicles began its decline as the prevalence of commercial patents filings increased in the early 1900s. Only now, as research and development yields diminishing returns in the area of combustion engines, can the battery catch up and move to the forefront. Number of patent applications published by sector by year. Patent applications in the field of batteries actually overtook those in the field of combustion engines around 2010. Many developments in the fields of batteries are not limited to vehicles alone and so few companies file patents directed at vehicular batteries per se. Innovation growth in the field of the combustion engine appears to be slowing. Between 1998 and 2018, the number of patent applications as a whole increased by ~350%. In the same time period, the number of applications relating to batteries grew by ~1150% whereas combustion engine applications grew by only ~200%. 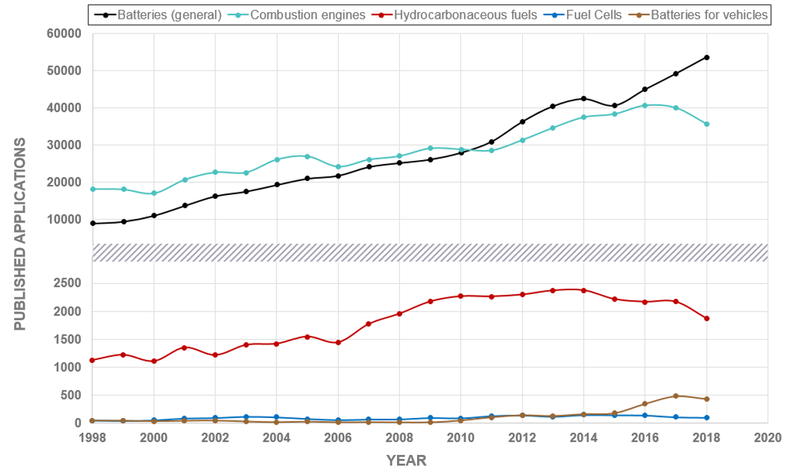 The combustion engine, lagging behind the general increase in total applications now constitutes a smaller percentage of all patents applications each year than it did in 1998. Trends even appear to indicate a small decline beginning in the number of annual applications relating to hydrocarbon fuels and the combustion engine but it is too early to conclude that this decline will continue in the long term. The resurgence of electric vehicles should perhaps serve as a cautionary tale for inventors and R&D teams involved in this battery resurgence. While the past can provide inspiration for new developments, care must be taken to ensure that new technology, and therefore new patent applications, are not pre-empted by research and development work carried out over a lifetime ago.